A scientist can demonstrate that it is possible to tap the energy of space but we will not believe him because what must not be can not be, in other words, what can not be explained by our scientific world view must not be examined ... it cannot even be acknowledged to exist. The following story is about just such a machine. It has been producing a constant if small energy output since 1950 and still going. It has been kept in a museum in Romania for all these years, waiting to be finally understood. 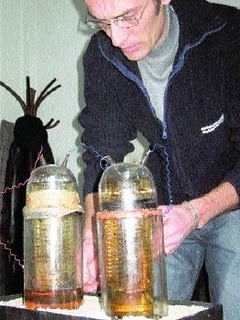 The "Dimitrie Leonida" National Technical Museum from Romania hosts a weird kind of battery. Built by Vasile Karpen, the pile has been working uninterrupted for 60 years. "I admit it's also hard for me to advance the idea of an overunity generator without sounding ridiculous, even if the object exists," says Nicolae Diaconescu, engineer and director of the museum. The invention cannot be exposed because the museum doesn't have enough money to buy the security system necessary for such an exhibit. Half a century ago, the pile's inventor had said it will work forever, and so far it looks like he was right. Karpen's perpetual motion machine now sits secured right in the director's office. It has been called "the uniform-temperature thermoelectric pile," and the first prototype has been built in the 1950s. Although it should have stopped working decades ago, it didn't. The scientists can't explain how the contraption, patented in 1922, works. The fact that still puzzles them is how a man of such a scientific stature such as Karpen's could have started building something "that crazy." 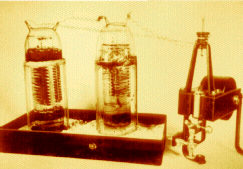 The prototype has been assembled in 1950 and consists of two series-connected electric piles moving a small galvanometric motor. The motor moves a blade that is connected to a switch. With every half rotation, the blade opens the circuit and closes it at the the start of the second half. The blade's rotation time had been calculated so that the piles have time to recharge and that they can rebuild their polarity during the time that the circuit is open. The purpose of the motor and the blades was to show that the piles actually generate electricity, but they're not needed anymore, since current technology allows us to measure all the parameters and outline all of them in a more proper way. A Romanian newspaper, ZIUA (The Day), went to the museum for an interview with director Diaconescu. He took the system our of its secured shelf and allowed the specialists to measure its output with a digital multimeter. This happened on Feb. 27, 2006, and the batteries had indicated the same 1 Volt as back in 1950. They had mentioned that "unlike the lessons they teach you in the 7th grade physics class, the 'Karpen's Pile' has one of its electrodes made of gold, the other of platinum, and the electrolyte (the liquid that the two electrodes are immersed in), is high-purity sulfuric acid." Karpen's device could be scaled up to harvest more power, adds Diaconescu. Karpen's battery had been exhibited in several scientific conferences in Paris, Bucharest and Bologna, Italy, where its construction had been explained widely. Researchers from the University of Brasov and the Polytechnic University of Bucharest in Romania have even performed special studies on the battery, but didn't pull a clear conclusion. "The French showed themselves very interested by this patrimonial object in the 70s, and wanted to take it. Our museum has been able to keep it, though. As time passed, the fact that the battery doesn't stop producing energy is more and more clear, giving birth to the legend of a perpetual motion machine." Some scientists say the device works by transforming thermal energy into mechanical work, but Diaconescu doesn't subscribe to this theory. According to some who studied Karpen's theoretical work, the pile he invented defies the second principle of thermodynamics (referring to the transformation of thermal energy into mechanical work), and this makes it a second-degree perpetual motion machine. Others say it doesn't, being merely a generalization to the law, and an application of zero point energy. If Karpen was right, and the principle is 100% correct, it would revolutionize all of the physics theories from the bottom up, with hard to imagine consequences. Though I guess this isn't going to happen very soon, the museum still needs proper private funding to acquire the necessary security equipment required by the police to exhibit the device. There is also an article on PESWiki. PESWiki has further links and is making all efforts to provide updates on attempts to duplicate the feat of Karpen. It could be Dracula flying back and forth thereby recharging the batteries. Here is the explanation: Platinum atom has 17 orbital electrons in its second inner orbit, whereas Gold has 18. Therefore Platitum will not be perfectly neutral and will be feebly negatively charged and with a feeble electrosttic field compared to Gold, which will be perfectly neutral.The electrostatic field of Platinum will pull electrons from the Gold atoms due to which the Gold atoms will get positively charged and the Platitum atoms will turn neutral. This intermittent flow of electons from Gold to Platinum and back to Gold will continue indefinitely and charge/ discharge the battery because as per the principles of Space Vortex Theory SVT) : (1) atoms are vortices of absolute vacuum(mass less, indestructable fluid medium)and electrons too are vacuum vortices (space vortices)(2) the continuous ineractions between the electrostatic field of charged atoms and and the charged elctrons do not lead to any depletion of their structural vortex energy as per SVT. I am absolute sure that there are many inventions of great genius, and they never made it any further then the room of the inventor ........ tragic? Yes indeed! A FREE ENERGY DEVICE WORKING CONTINUOUSLY FOR SIXTY YEARS !!!! If Karpen was right, and the principle is 100% correct, it would revolutionize all of the physics theories from the bottom up, with hard to imagine consequences. A small correction to my earlier comment of 12 January, 2011. Platinum atom with 17 electrons in its inner-second orbit has one elcron less for an overall neutraliy. Therefore it is feebly positively charged (not negatively as given in the earlier comment) and the rest of the explanation remains the same as before. It would be good to see if the battery continues to work inside a really good Faraday cage. This would rule out the possibility that the dissimilar metal electrodes (or some other part of the circuit) is rectifying alternating electromagnetic waves like a radio detector.